Have you ever read a new perspective on an art form, to be precise your art form, that keeps you thinking about it days afterward? An idea that makes you look with fresh eyes at your long sought after passion? I've photographed over 100 floral still life portraits. Most of them cut flowers in a beautiful vase placed in dramatic lighting with long shadows. All of them I love, the subject, the process and the final image. However, I keep thinking about this conversation between an art instructor (Julius Weisz) and an art student (Cymbeline) in Europe, circa 1910 in the novel, "Eight Girls Taking Pictures" by Whitney Otto. "What do you think about photographing flowers?" she asked. "It depends if you're talking about living flowers or cut flowers." She was about to ask him about the difference when he said, "One is memento mori, so to speak. Its life is ended, its appearance in rapid decline. As a photographer you have a completely different set of problems to solve when you photograph cut flowers." "Like this picture with the reflection of the water and the table and wall? she asked. They were looking at de Meyer's hydrangea blossoms. "Sure, okay. Let's take this picture. There is the problem of the light bouncing on the reflection of the water, the glass the tabletop, and the wall. But any picture could deal with the problem of light. The problem with this picture is greater than that of reflective surfaces--it's one of death. You invite a profound theme into your work when you choose cut flowers. You are talking about mortality and time moving forward. You are saying that everything, everything we see and experience and love happens uniquely and happens only once. When you take a picture of a flower in a glass you are, paradoxically, capturing evanescence. You are also showing the indifference of Nature. There is no mourning in a flower photograph, only a shrugging of the shoulders." Now I am being more mindful of what I'm photographing and how many flowers are dying for my photo still life portraits. I think it's time for something new. 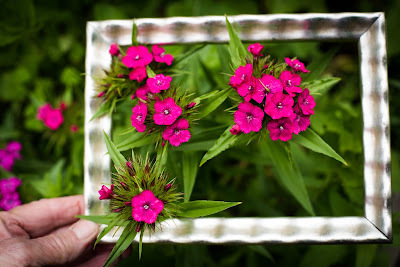 How about if I literally frame the flowers to hold them sacred and do them no harm?